Text: Phillip Brooks/William Dix/trans. John S. Dwight/Martin Luther/Charles Wesley/Joseph Mohr/Henry W. Longfellow. The traditional message of Christmas expressed through stories of beloved carols; how they were written and what effect they have had in the lives of Christian people worldwide. 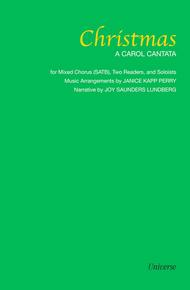 Narration for 2 readers and medium woman's voice, tenor and baritone solos are included. September 28, 2017 Nice history lesson! This cantata is nicely written, with readings about the history of the hymns. The most beloved Christmas Carols each have a story behind them. The lyricists & composers stories highlight the power of each carol, with easy and lovely choral arrangements.